For other uses, see Cicero (disambiguation). Marcus Tullius Cicero[n 1] (/ˈsɪsəroʊ/; Classical Latin: [ˈmaːr.kʊs ˈtʊl.lɪ.ʊs ˈkɪ.kɛ.roː]; 106 BC – 7 December 43 BC) was a Roman statesman, orator, lawyer and philosopher, who served as consul in the year 63 BC. He came from a wealthy municipal family of the Roman equestrian order, and is considered one of Rome's greatest orators and prose stylists. His influence on the Latin language was so immense that the subsequent history of prose, not only in Latin but in European languages up to the 19th century, was said to be either a reaction against or a return to his style. Cicero introduced the Romans to the chief schools of Greek philosophy and created a Latin philosophical vocabulary (with neologisms such as evidentia, humanitas, qualitas, quantitas, and essentia) distinguishing himself as a translator and philosopher. Though he was an accomplished orator and successful lawyer, Cicero believed his political career was his most important achievement. It was during his consulship that the second Catilinarian conspiracy attempted to overthrow the government through an attack on the city by outside forces, and Cicero suppressed the revolt by summarily and controversially executing five conspirators. During the chaotic latter half of the 1st century BC marked by civil wars and the dictatorship of Gaius Julius Caesar, Cicero championed a return to the traditional republican government. Following Julius Caesar's death, Cicero became an enemy of Mark Antony in the ensuing power struggle, attacking him in a series of speeches. He was proscribed as an enemy of the state by the Second Triumvirate and consequently executed by soldiers operating on their behalf in 43 BC after having been intercepted during an attempted flight from the Italian peninsula. His severed hands and head were then, as a final revenge of Mark Antony, displayed on The Rostra. Petrarch's rediscovery of Cicero's letters is often credited for initiating the 14th-century Renaissance in public affairs, humanism, and classical Roman culture. According to Polish historian Tadeusz Zieliński, "the Renaissance was above all things a revival of Cicero, and only after him and through him of the rest of Classical antiquity." The peak of Cicero's authority and prestige came during the 18th-century Enlightenment, and his impact on leading Enlightenment thinkers and political theorists such as John Locke, David Hume, Montesquieu and Edmund Burke was substantial. His works rank among the most influential in European culture, and today still constitute one of the most important bodies of primary material for the writing and revision of Roman history, especially the last days of the Roman Republic. Cicero was born in 106 BC in Arpinum, a hill town 100 kilometers (62 mi) southeast of Rome. He belonged to the tribus Cornelia. His father was a well-to-do member of the equestrian order and possessed good connections in Rome. However, being a semi-invalid, he could not enter public life and studied extensively to compensate. Although little is known about Cicero's mother, Helvia, it was common for the wives of important Roman citizens to be responsible for the management of the household. Cicero's brother Quintus wrote in a letter that she was a thrifty housewife. Cicero's interest in philosophy figured heavily in his later career and led to him providing a comprehensive account of Greek philosophy for a Roman audience, including creating a philosophical vocabulary in Latin. In 87 BC, Philo of Larissa, the head of the Academy that was founded by Plato in Athens about 300 years earlier, arrived in Rome. Cicero, "inspired by an extraordinary zeal for philosophy", sat enthusiastically at his feet and absorbed Plato's philosophy. Cicero said of Plato's Dialogues, that if Zeus were to speak, he would use their language. According to Plutarch, Cicero was an extremely talented student, whose learning attracted attention from all over Rome, affording him the opportunity to study Roman law under Quintus Mucius Scaevola. Cicero's fellow students were Gaius Marius Minor, Servius Sulpicius Rufus (who became a famous lawyer, one of the few whom Cicero considered superior to himself in legal matters), and Titus Pomponius. The latter two became Cicero's friends for life, and Pomponius (who later received the nickname "Atticus", and whose sister married Cicero's brother) would become, in Cicero's own words, "as a second brother", with both maintaining a lifelong correspondence. In 79 BC, Cicero left for Greece, Asia Minor and Rhodes. This was perhaps to avoid the potential wrath of Sulla, as Plutarch claims, though Cicero himself says it was to hone his skills and improve his physical fitness. In Athens he studied philosophy with Antiochus of Ascalon, the 'Old Academic' and initiator of Middle Platonism. In Asia Minor, he met the leading orators of the region and continued to study with them. Cicero then journeyed to Rhodes to meet his former teacher, Apollonius Molon, who had previously taught him in Rome. Molon helped Cicero hone the excesses in his style, as well as train his body and lungs for the demands of public speaking. Charting a middle path between the competing Attic and Asiatic styles, Cicero would ultimately become considered second only to Demosthenes among history's orators. Cicero married Terentia probably at the age of 27, in 79 BC. According to the upper class mores of the day it was a marriage of convenience, but lasted harmoniously for nearly 30 years. Terentia's family was wealthy, probably the plebeian noble house of Terenti Varrones, thus meeting the needs of Cicero's political ambitions in both economic and social terms. She had a half-sister named Fabia, who as a child had become a Vestal Virgin, a very great honour. Terentia was a strong willed woman and (citing Plutarch) "she took more interest in her husband's political career than she allowed him to take in household affairs." Although his marriage to Terentia was one of convenience, it is commonly known that Cicero held great love for his daughter Tullia. When she suddenly became ill in February 45 BC and died after having seemingly recovered from giving birth to a son in January, Cicero was stunned. "I have lost the one thing that bound me to life" he wrote to Atticus. Atticus told him to come for a visit during the first weeks of his bereavement, so that he could comfort him when his pain was at its greatest. In Atticus's large library, Cicero read everything that the Greek philosophers had written about overcoming grief, "but my sorrow defeats all consolation." Caesar and Brutus as well as Servius Sulpicius Rufus sent him letters of condolence. Cicero hoped that his son Marcus would become a philosopher like him, but Marcus himself wished for a military career. He joined the army of Pompey in 49 BC and after Pompey's defeat at Pharsalus 48 BC, he was pardoned by Caesar. Cicero sent him to Athens to study as a disciple of the peripatetic philosopher Kratippos in 48 BC, but he used this absence from "his father's vigilant eye" to "eat, drink and be merry." After Cicero's murder he joined the army of the Liberatores but was later pardoned by Augustus. Augustus's bad conscience for not having objected to Cicero's being put on the proscription list during the Second Triumvirate led him to aid considerably Marcus Minor's career. He became an augur, and was nominated consul in 30 BC together with Augustus. As such, he was responsible for revoking the honors of Mark Antony, who was responsible for the proscription, and could in this way take revenge. Later he was appointed proconsul of Syria and the province of Asia. Cicero wanted to pursue a public career in politics along the steps of the Cursus honorum. In 90–88 BC, he served both Pompeius Strabo and Lucius Cornelius Sulla as they campaigned in the Social War, though he had no taste for military life, being an intellectual first and foremost. Cicero started his career as a lawyer around 83–81 BC. The first extant speech is a private case from 81 BC (the pro Quinctio), delivered when Cicero was aged 26, though he refers throughout to previous defenses he had already undertaken. His first major public case, of which a written record is still extant, was his 80 BC defense of Sextus Roscius on the charge of patricide. Taking this case was a courageous move for Cicero; patricide was considered an appalling crime, and the people whom Cicero accused of the murder, the most notorious being Chrysogonus, were favorites of Sulla. At this time it would have been easy for Sulla to have the unknown Cicero murdered. Cicero's defense was an indirect challenge to the dictator Sulla, and on the strength of his case, Roscius was acquitted. Soon after, Cicero again challenged Sulla, by criticising his disenfranchisement of Italian towns in a lost speech on behalf of a woman from Arretium. Cicero's case in the Pro Roscio Amerino was divided into three parts. The first part detailed exactly the charge brought by Ericius. Cicero explained how a rustic son of a farmer, who lives off the pleasures of his own land, would not have gained anything from committing patricide because he would have eventually inherited his father's land anyway. The second part concerned the boldness and greed of two of the accusers, Magnus and Capito. Cicero told the jury that they were the more likely perpetrators of murder because the two were greedy, both for conspiring together against a fellow kinsman and, in particular, Magnus, for his boldness and for being unashamed to appear in court to support the false charges. The third part explained that Chrysogonus had immense political power, and the accusation was successfully made due to that power. Even though Chrysogonus may not have been what Cicero said he was, through rhetoric Cicero successfully made him appear to be a foreign freed man who prospered by devious means in the aftermath of the civil war. Cicero surmised that it showed what kind of a person he was and that something like murder was not beneath him. His first office was as one of the twenty annual quaestors, a training post for serious public administration in a diversity of areas, but with a traditional emphasis on administration and rigorous accounting of public monies under the guidance of a senior magistrate or provincial commander. Cicero served as quaestor in western Sicily in 75 BC and demonstrated honesty and integrity in his dealings with the inhabitants. As a result, the grateful Sicilians asked Cicero to prosecute Gaius Verres, a governor of Sicily, who had badly plundered the province. His prosecution of Gaius Verres was a great forensic success for Cicero. Governor Gaius Verres hired the prominent lawyer of a noble family Quintus Hortensius Hortalus. After a lengthy period in Sicily collecting testimonials and evidence and persuading witnesses to come forward, Cicero returned to Rome and won the case in a series of dramatic court battles. His unique style of oratory set him apart from the flamboyant Hortensius. On the conclusion of this case, Cicero came to be considered the greatest orator in Rome. The view that Cicero may have taken the case for reasons of his own is viable. Hortensius was, at this point, known as the best lawyer in Rome; to beat him would guarantee much success and the prestige that Cicero needed to start his career. Cicero's oratorical skill is shown in his character assassination of Verres and various other techniques of persuasion used on the jury. One such example is found in the speech Against Verres I, where he states "with you on this bench, gentlemen, with Marcus Acilius Glabrio as your president, I do not understand what Verres can hope to achieve". Oratory was considered a great art in ancient Rome and an important tool for disseminating knowledge and promoting oneself in elections, in part because there were no regular newspapers or mass media. Cicero was neither a patrician nor a plebeian noble; his rise to political office despite his relatively humble origins has traditionally been attributed to his brilliance as an orator. Cicero grew up in a time of civil unrest and war. Sulla's victory in the first of a series of civil wars led to a new constitutional framework that undermined libertas (liberty), the fundamental value of the Roman Republic. Nonetheless, Sulla's reforms strengthened the position of the equestrian class, contributing to that class's growing political power. Cicero was both an Italian eques and a novus homo, but more importantly he was a Roman constitutionalist. His social class and loyalty to the Republic ensured that he would "command the support and confidence of the people as well as the Italian middle classes". The optimates faction never truly accepted Cicero; and this undermined his efforts to reform the Republic while preserving the constitution. Nevertheless, he successfully ascended the cursus honorum, holding each magistracy at or near the youngest possible age: quaestor in 75 BC (age 31), aedile in 69 BC (age 37), and praetor in 66 BC (age 40), when he served as president of the "Reclamation" (or extortion) Court. He was then elected consul at age 43. Cicero was elected consul for the year 63 BC. His co-consul for the year, Gaius Antonius Hybrida, played a minor role. During his year in office, he thwarted a conspiracy centered on assassinating him and overthrowing the Roman Republic with the help of foreign armed forces, led by Lucius Sergius Catilina. Cicero procured a senatus consultum ultimum (a declaration of martial law) and drove Catiline from the city with four vehement speeches (the Catiline Orations), which to this day remain outstanding examples of his rhetorical style. The Orations listed Catiline and his followers' debaucheries, and denounced Catiline's senatorial sympathizers as roguish and dissolute debtors clinging to Catiline as a final and desperate hope. Cicero demanded that Catiline and his followers leave the city. At the conclusion of his first speech, Catiline hurriedly left the Senate, (which was being held in the Temple of Jupiter Stator). In his following speeches, Cicero did not directly address Catiline. He delivered the second and third orations before the people, and the last one again before the Senate. By these speeches, Cicero wanted to prepare the Senate for the worst possible case; he also delivered more evidence, against Catiline. Catiline fled and left behind his followers to start the revolution from within while Catiline assaulted the city with an army of "moral bankrupts and honest fanatics". Catiline had attempted to involve the Allobroges, a tribe of Transalpine Gaul, in their plot, but Cicero, working with the Gauls, was able to seize letters that incriminated the five conspirators and forced them to confess in front of the Senate. The Senate then deliberated upon the conspirators' punishment. As it was the dominant advisory body to the various legislative assemblies rather than a judicial body, there were limits to its power; however, martial law was in effect, and it was feared that simple house arrest or exile – the standard options – would not remove the threat to the state. At first Decimus Silanus spoke for the "extreme penalty"; many were swayed by Julius Caesar, who decried the precedent it would set and argued in favor of life imprisonment in various Italian towns. Cato the Younger rose in defense of the death penalty and the entire Senate finally agreed on the matter. Cicero had the conspirators taken to the Tullianum, the notorious Roman prison, where they were strangled. 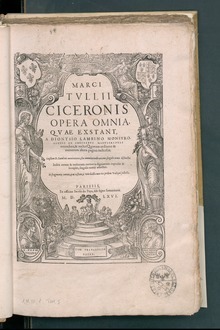 Cicero himself accompanied the former consul Publius Cornelius Lentulus Sura, one of the conspirators, to the Tullianum. Cicero received the honorific "Pater Patriae" for his efforts to suppress the conspiracy, but lived thereafter in fear of trial or exile for having put Roman citizens to death without trial. After the conspirators were put to death, Cicero was proud of his accomplishment. Some of his political enemies argued that though the act gained Cicero popularity, he exaggerated the extent of his success. He overestimated his popularity again several years later after being exiled from Italy and then allowed back from exile. At this time, he claimed that the Republic would be restored along with him. Many Romans at the time, led by Populares politicians Gaius Julius Caesar and patrician turned plebeian Publius Clodius Pulcher believed that Cicero's evidence against Catiline was fabricated and the witnesses were bribed. This was done in a concerted effort by Optimate politicians to prevent social changes in Rome, both the city and throughout the Roman Empire. Catiline had campaigned for and lost the office of Consul four times in as many consecutive years, the last being in 63 BC, the year of Cicero's consulship, for the year 62 with support from the Populares. Cicero, who had been elected Consul with the support of the Optimates, promoted their position as advocates of the status quo resisting social changes, especially more rights for the average inhabitants of Rome. Just after completing his consulship, in late 62 BC, Cicero arranged the purchase of a large townhouse on the Palatine Hill previously owned by Rome's richest citizen, Marcus Licinius Crassus. It cost an exorbitant sum, 3.5 million sesterces, which required Cicero to arrange for a loan from Mark Antony based on the expected profits from Antony's proconsulship in Macedonia. In return Cicero gained a lavish house which he proudly boasted was "in conspectu prope totius urbis" (in sight of nearly the whole city), only a short walk away from the Roman Forum. In 60 BC, Julius Caesar invited Cicero to be the fourth member of his existing partnership with Pompey and Marcus Licinius Crassus, an assembly that would eventually be called the First Triumvirate. Cicero refused the invitation because he suspected it would undermine the Republic. In 58 BC, Publius Clodius Pulcher, then one of the tribunes of the plebs, introduced a law (the Leges Clodiae) threatening exile to anyone who executed a Roman citizen without a trial. Cicero, having executed members of the Catiline Conspiracy four years previously without formal trial, and having had a public falling out with Clodius, was clearly the intended target of the law. Furthermore, many believed that Clodius acted in concert with Julius Caesar who feared that Cicero would seek to abolish many of Caesar's accomplishments while Consul in 59 BC, whom he did not support. Cicero argued that the senatus consultum ultimum indemnified him from punishment, and he attempted to gain the support of the senators and consuls, especially of Pompey. When help was not forthcoming, he went into exile. He arrived at Thessalonica, on 23 May 58 BC. In his absence, Clodius, who lived next door to Cicero on the Palatine, arranged for Cicero's house to be confiscated by the state, and was even able to purchase a part of the property in order to extend his own house. After demolishing Cicero's house, Clodius had the land consecrated and symbolically erected a Temple of Liberty (aedes Libertatis) on the vacant spot. Cicero's exile caused him to fall into depression. He wrote to Atticus: "Your pleas have prevented me from committing suicide. But what is there to live for? Don't blame me for complaining. My afflictions surpass any you ever heard of earlier". After the intervention of recently elected tribune Titus Annius Milo (probably working on the behalf of Pompey who wanted Cicero back to help him against Clodius), the senate voted in favor of recalling Cicero from exile. Clodius cast the single vote against the decree. Cicero returned to Italy on 5 August 57 BC, landing at Brundisium. He was greeted by a cheering crowd, and, to his delight, his beloved daughter Tullia. In his Oratio De Domo Sua Ad Pontices, Cicero convinced the College of Pontiffs to rule that the consecration of his land was invalid, thereby allowing him to regain his property and rebuild his house on the Palatine. Cicero tried to re-enter politics, but his attack on a bill of Caesar's proved unsuccessful. The conference at Luca in 56 BC forced Cicero to recant and support the triumvirate. After this, a cowed Cicero concentrated on his literary works. It is uncertain whether he was directly involved in politics for the following few years. In 51 BC he reluctantly accepted a promagistracy (as proconsul) in Cilicia for the year, because there were few other eligible governors available as a result of a legislative requirement enacted by Pompey in 52 BC, specifying an interval of five years between a consulship or praetorship and a provincial command. He served as proconsul of Cilicia from May 51 to November 50 BC. He was given instructions to keep nearby Cappadocia loyal to the King, Ariobarzanes III, which he achieved 'satisfactorily without war.' In 53 BC Marcus Licinius Crassus had been defeated by the Parthians at the battle of Carrhae, this opened up the Roman East for a Parthian invasion causing much unrest in Syria and Cilicia. Cicero restored calm by his mild system of government. He discovered that much of public property had been embezzled by corrupt previous governors and their staffs, and did his utmost to restore it. Thus he greatly improved the condition of the cities. He retained the civil rights of, and exempted from penalties, the men who gave the property back. Besides this, he was extremely frugal in his outlays for staff and private expenses during his governorship, and this made him highly popular among the natives. Previous governors had extorted enormous sums from the provincials in order to supply their households and bodyguard. Besides his activity in ameliorating the hard pecuniary situation of the province, Cicero was also creditably active in the military sphere. Early in his governorship he received information that prince Pacorus, son of Orodes II the king of the Parthians, had crossed the Euphrates, and was ravaging the Syrian countryside and even besieged Cassius (the interim Roman commander in Syria) in Antioch. Cicero eventually marched with two understrength legions and a large contingent of auxiliary cavalry to Cassius' relief. Pacorus and his army had already given up on besieging Antioch and were heading south through Syria, ravaging the countryside again, Cassius and his legions followed them, harrying them wherever they went, eventually ambushing and defeating them near Antigonea. Another large troop of Parthian horsemen was defeated by Cicero's cavalry who happened to run into them while scouting ahead of the main army. Cicero next defeated some robbers who were based on Mount Amanus and was hailed as imperator by his troops. Afterwards he led his army against the independent Cilician mountain tribes, besieging their fortress of Pindenissum. It took him 47 days to reduce the place, which fell in December. Then Cicero left the province to his brother Quintus, who had accompanied him on his governorship as his legate. On his way back to Rome he stopped over in Rhodes and then went to Athens, where he caught up with his old friend Titus Pomponius Atticus and met men of great learning. The struggle between Pompey and Julius Caesar grew more intense in 50 BC. Cicero favored Pompey, seeing him as a defender of the senate and Republican tradition, but at that time avoided openly alienating Caesar. When Caesar invaded Italy in 49 BC, Cicero fled Rome. Caesar, seeking an endorsement by a senior senator, courted Cicero's favor, but even so Cicero slipped out of Italy and traveled to Dyrrachium (Epidamnos), Illyria, where Pompey's staff was situated. Cicero traveled with the Pompeian forces to Pharsalus in 48 BC, though he was quickly losing faith in the competence and righteousness of the Pompeian side. Eventually, he provoked the hostility of his fellow senator Cato, who told him that he would have been of more use to the cause of the optimates if he had stayed in Rome. After Caesar's victory at the Battle of Pharsalus on 9 August, Cicero returned to Rome only very cautiously. Caesar pardoned him and Cicero tried to adjust to the situation and maintain his political work, hoping that Caesar might revive the Republic and its institutions. In a letter to Varro on c. 20 April 46 BC, Cicero outlined his strategy under Caesar's dictatorship. Cicero, however, was taken completely by surprise when the Liberatores assassinated Caesar on the ides of March, 44 BC. Cicero was not included in the conspiracy, even though the conspirators were sure of his sympathy. Marcus Junius Brutus called out Cicero's name, asking him to restore the republic when he lifted his bloodstained dagger after the assassination. A letter Cicero wrote in February 43 BC to Trebonius, one of the conspirators, began, "How I could wish that you had invited me to that most glorious banquet on the Ides of March"! Cicero became a popular leader during the period of instability following the assassination. He had no respect for Mark Antony, who was scheming to take revenge upon Caesar's murderers. In exchange for amnesty for the assassins, he arranged for the Senate to agree not to declare Caesar to have been a tyrant, which allowed the Caesarians to have lawful support and kept Caesar's reforms and policies intact. Cicero and Antony now became the two leading men in Rome: Cicero as spokesman for the Senate; Antony as consul, leader of the Caesarian faction, and unofficial executor of Caesar's public will. Relations between the two, never friendly, worsened after Cicero claimed that Antony was taking liberties in interpreting Caesar's wishes and intentions. Octavian was Caesar's adopted son and heir. After he returned to Italy, Cicero began to play him against Antony. He praised Octavian, declaring he would not make the same mistakes as his father. He attacked Antony in a series of speeches he called the Philippics, after Demosthenes's denunciations of Philip II of Macedon. At the time Cicero's popularity as a public figure was unrivalled. Cicero supported Decimus Junius Brutus Albinus as governor of Cisalpine Gaul (Gallia Cisalpina) and urged the Senate to name Antony an enemy of the state. The speech of Lucius Piso, Caesar's father-in-law, delayed proceedings against Antony. Antony was later declared an enemy of the state when he refused to lift the siege of Mutina, which was in the hands of Decimus Brutus. Cicero's plan to drive out Antony failed. Antony and Octavian reconciled and allied with Lepidus to form the Second Triumvirate after the successive battles of Forum Gallorum and Mutina. The Triumvirate began proscribing their enemies and potential rivals immediately after legislating the alliance into official existence for a term of five years with consular imperium. Cicero and all of his contacts and supporters were numbered among the enemies of the state, even though Octavian argued for two days against Cicero being added to the list. Cicero was one of the most viciously and doggedly hunted among the proscribed. He was viewed with sympathy by a large segment of the public and many people refused to report that they had seen him. He was caught 7 December 43 BC leaving his villa in Formiae in a litter going to the seaside where he hoped to embark on a ship destined for Macedonia. When his killers – Herennius (a centurion) and Popilius (a tribune) – arrived, Cicero's own slaves said they had not seen him, but he was given away by Philologus, a freedman of his brother Quintus Cicero. Cicero's last words are said to have been, "There is nothing proper about what you are doing, soldier, but do try to kill me properly." He bowed to his captors, leaning his head out of the litter in a gladiatorial gesture to ease the task. By baring his neck and throat to the soldiers, he was indicating that he would not resist. According to Plutarch, Herennius first slew him, then cut off his head. On Antony's instructions his hands, which had penned the Philippics against Antony, were cut off as well; these were nailed along with his head on the Rostra in the Forum Romanum according to the tradition of Marius and Sulla, both of whom had displayed the heads of their enemies in the Forum. Cicero was the only victim of the proscriptions who was displayed in that manner. According to Cassius Dio (in a story often mistakenly attributed to Plutarch), Antony's wife Fulvia took Cicero's head, pulled out his tongue, and jabbed it repeatedly with her hairpin in final revenge against Cicero's power of speech. Cicero's son, Marcus Tullius Cicero Minor, during his year as a consul in 30 BC, avenged his father's death, to a certain extent, when he announced to the Senate Mark Antony's naval defeat at Actium in 31 BC by Octavian and his capable commander-in-chief, Agrippa. Cicero's career as a statesman was marked by inconsistencies and a tendency to shift his position in response to changes in the political climate. His indecision may be attributed to his sensitive and impressionable personality; he was prone to overreaction in the face of political and private change. "Would that he had been able to endure prosperity with greater self-control, and adversity with more fortitude!" wrote C. Asinius Pollio, a contemporary Roman statesman and historian. Henry VIII's childhood copy of De Officiis, bearing the inscription in his hand, "Thys boke is myne Prynce Henry"
Cicero has been traditionally considered the master of Latin prose, with Quintilian declaring that Cicero was "not the name of a man, but of eloquence itself." The English words Ciceronian (meaning "eloquent") and cicerone (meaning "local guide") derive from his name. He is credited with transforming Latin from a modest utilitarian language into a versatile literary medium capable of expressing abstract and complicated thoughts with clarity. Julius Caesar praised Cicero's achievement by saying "it is more important to have greatly extended the frontiers of the Roman spirit (ingenium) than the frontiers of the Roman empire". According to John William Mackail, "Cicero's unique and imperishable glory is that he created the language of the civilized world, and used that language to create a style which nineteen centuries have not replaced, and in some respects have hardly altered." Petrarch's rediscovery of Cicero's letters provided the impetus for searches for ancient Greek and Latin writings scattered throughout European monasteries, and the subsequent rediscovery of classical antiquity led to the Renaissance. Subsequently, Cicero became synonymous with classical Latin to such an extent that a number of humanist scholars began to assert that no Latin word or phrase should be used unless it appeared in Cicero's works, a stance criticized by Erasmus. His voluminous correspondence, much of it addressed to his friend Atticus, has been especially influential, introducing the art of refined letter writing to European culture. Cornelius Nepos, the 1st century BC biographer of Atticus, remarked that Cicero's letters contained such a wealth of detail "concerning the inclinations of leading men, the faults of the generals, and the revolutions in the government" that their reader had little need for a history of the period. Among Cicero's admirers were Desiderius Erasmus, Martin Luther, and John Locke. Following the invention of Johannes Gutenberg's printing press, De Officiis was the second book printed in Europe, after the Gutenberg Bible. Scholars note Cicero's influence on the rebirth of religious toleration in the 17th century. Cicero was especially popular with the Philosophes of the 18th century, including Edward Gibbon, Diderot, David Hume, Montesquieu, and Voltaire. Gibbon wrote of his first experience reading the author's collective works thus: "I tasted the beauty of the language; I breathed the spirit of freedom; and I imbibed from his precepts and examples the public and private sense of a man...after finishing the great author, a library of eloquence and reason, I formed a more extensive plan of reviewing the Latin classics..." Voltaire called Cicero "the greatest as well as the most elegant of Roman philosophers" and even staged a play based on Cicero's role in the Catilinarian conspiracy, called Rome Sauvée, ou Catilina, to "make young people who go to the theatre acquainted with Cicero." Voltaire was spurred to pen the drama as a rebuff to his rival Claude Prosper Jolyot de Crébillon's own play Catilina, which had portrayed Cicero as a coward and villain who hypocritically married his own daughter to Catiline. Montesquieu produced his "Discourse on Cicero" in 1717, in which he heaped praise on the author because he rescued "philosophy from the hands of scholars, and freed it from the confusion of a foreign language". Montesquieu went on to declare that Cicero was "of all the ancients, the one who had the most personal merit, and whom I would prefer to resemble." Across the Atlantic, Cicero the republican inspired the Founding Fathers of the United States and the revolutionaries of the French Revolution. John Adams said, "As all the ages of the world have not produced a greater statesman and philosopher united than Cicero, his authority should have great weight." Jefferson names Cicero as one of a handful of major figures who contributed to a tradition "of public right" that informed his draft of the Declaration of Independence and shaped American understandings of "the common sense" basis for the right of revolution. Camille Desmoulins said of the French republicans in 1789 that they were "mostly young people who, nourished by the reading of Cicero at school, had become passionate enthusiasts for liberty". Jim Powell starts his book on the history of liberty with the sentence: "Marcus Tullius Cicero expressed principles that became the bedrock of liberty in the modern world." Likewise, no other ancient personality has inspired as much venomous dislike as Cicero, especially in more modern times. His commitment to the values of the Republic accommodated a hatred of the poor and persistent opposition to the advocates and mechanisms of popular representation. Friedrich Engels referred to him as "the most contemptible scoundrel in history" for upholding republican "democracy" while at the same time denouncing land and class reforms. Cicero has faced criticism for exaggerating the democratic qualities of republican Rome, and for defending the Roman oligarchy against the popular reforms of Caesar. Michael Parenti admits Cicero's abilities as an orator, but finds him a vain, pompous and hypocritical personality who, when it suited him, could show public support for popular causes that he privately despised. Parenti presents Cicero's prosecution of the Catiline conspiracy as legally flawed at least, and possibly unlawful. Cicero also had an influence on modern astronomy. Nicolaus Copernicus, searching for ancient views on earth motion, said that he "first ... found in Cicero that Hicetas supposed the earth to move." Cicero was declared a righteous pagan by the Early Church, and therefore many of his works were deemed worthy of preservation. The Bogomils considered him a rare exception of a pagan saint. Subsequent Roman and medieval Christian writers quoted liberally from his works De Re Publica (On the Commonwealth) and De Legibus (On the Laws), and much of his work has been recreated from these surviving fragments. Cicero also articulated an early, abstract conceptualization of rights, based on ancient law and custom. Of Cicero's books, six on rhetoric have survived, as well as parts of eight on philosophy. Of his speeches, 88 were recorded, but only 58 survive. Cicero's great repute in Italy has led to numerous ruins being identified as having belonged to him, though none have been substantiated with absolute certainty. In Formia, two Roman-era ruins are popularly believed to be Cicero's mausoleum, the Tomba di Cicerone, and the villa where he was assassinated in 43 BC. The latter building is centered around a central hall with Doric columns and a coffered vault, with a separate nymphaeum, on five acres of land near Formia. A modern villa was built on the site after the Rubino family purchased the land from Ferdinand II of the Two Sicilies in 1868. Cicero's supposed tomb is a 24 meter (79 feet) tall tower on an opus quadratum base on the ancient Via Appia outside of Formia. Some suggest that it is not in fact Cicero's tomb, but a monument built on the spot where Cicero was intercepted and assassinated while trying to reach the sea. In Rome, the location of Cicero's house has been roughly identified from excavations of the Republican-era stratum on the northwestern slope of the Palatine Hill. Cicero's domus has long been known to have stood in the area, according to his own descriptions and those of later authors, but there is some debate about whether it stood near the base of the hill, very close to the Roman Forum, or nearer to the summit. During his life the area was the most desirable in Rome, densely occupied with Patrician houses including the Domus Publica of Julius Caesar and the home of Cicero's mortal enemy Clodius. In the early Imperial era these properties fell into the possession of the Julio-Claudian dynasty and the substructures of the Domus Tiberiana were built over the Republican-era buildings. Ben Jonson dramatised the conspiracy of Catiline in his play Catiline His Conspiracy, featuring Cicero as a character. Cicero also appears as a minor character in William Shakespeare's play Julius Caesar. Cicero was portrayed on the motion picture screen by British actor Alan Napier in the 1953 film Julius Caesar, based on Shakespeare's play. He has also been played by such noted actors as Michael Hordern (in Cleopatra), and André Morell (in the 1970 Julius Caesar). Most recently, Cicero was portrayed by David Bamber in the HBO series Rome (2005–2007) and appeared in both seasons. In the historical novel series Masters of Rome, Colleen McCullough presents a not-so-flattering depiction of Cicero's career, showing him struggling with an inferiority complex and vanity, morally flexible and fatally indiscreet, while his rival Julius Caesar is shown in a more approving light. Cicero is portrayed as a hero in the novel A Pillar of Iron by Taylor Caldwell (1965). Robert Harris' novels Imperium, Lustrum (published under the name Conspirata in the United States) and Dictator is the three-part novel series based upon the life of Cicero. In these novels Cicero's character is depicted in a more balanced way than in those of McCullough, with his positive traits equaling or outweighing his weaknesses (while conversely Caesar is depicted as more sinister than in McCullough). Cicero is a major recurring character in the Roma Sub Rosa series of mystery novels by Steven Saylor. He also appears several times as a peripheral character in John Maddox Roberts' SPQR series. ^ Merriam-Webster, Inc (1995). "Ciceronian period". Merriam-Webster's Encyclopedia of Literature. Merriam-Webster. p. 244. ISBN 978-0-87779-042-6. Retrieved 27 August 2013. ^ Wootton, David (1996). Modern Political Thought: Readings from Machiavelli to Nietzsche. Hackett Publishing. p. 1. ISBN 978-0-87220-341-9. Retrieved 27 August 2013. ^ Wood, Neal (1991). Cicero's Social and Political Thought. University of California Press. ISBN 978-0-520-07427-9. ^ Nicgorski, Walter. "Cicero and the Natural Law". Natural Law, Natural Rights, and American Constitutionalism. ^ Griffin, Miriam; Boardman, John; Griffin, Jasper; Murray, Oswyn (2001). The Oxford Illustrated History of the Roman World. Oxford University Press. pp. 76ff. ISBN 978-0-19-285436-0. Retrieved 10 August 2011. ^ Plutarch. "Life of Caesar". University of Chicago. p. 447. After this, Sulla's power being now on the wane, and Caesar's friends at home inviting him to return, Caesar sailed to Rhodes to study under Apollonius the son of Molon, an illustrious rhetorician with the reputation of a worthy character, of whom Cicero also was a pupil. ^ Vasaly, Ann (1993). Representation: Images of the World in a Ciceronian Territory. Berkeley: University of California Press. pp. 158–68. ISBN 978-0-520-07755-3. Archived from the original on 6 March 2014. ^ Boardman, John (18 January 2001). The Oxford illustrated history of the Roman world. pp. 84ff. ISBN 978-0-19-285436-0. Retrieved 10 August 2011. ^ Cicero, In Catilinam 3.2[dead link] (at the Perseus Project); Sallust, Bellum Catilinae 40–45 (at Lacus Curtius); Plutarch, Cicero 18.4 (at Lacus Curtius). ^ Clayton, Edward. "Cicero (106–43 BC)". Internet Encyclopedia of Philosophy. Retrieved 21 October 2013. ^ a b Steven M. Cerutti (1997). "The Location of the Houses of Cicero and Clodius and the Porticus Catuli on the Palatine Hill". 118 (3). American Journal of Philology. p. 417. ^ Yelegaonkar, Dr Shrikant (2009). Western Thinker's in Political Science. Lulu.com. ISBN 978-1-329-08277-9. ^ Cicero. De Domo Sua. perseus.tufts.edu. ^ Plutarch. "Life of Caesar". University of Chicago. p. 575. It was Cicero who proposed the first honours for [Caesar] in the senate, and their magnitude was, after all, not too great for a man; but others added excessive honours and vied with one another in proposing them, thus rendering Caesar odious and obnoxious even to the mildest citizens because of the pretension and extravagance of what was decreed for him. ^ "World History in Context". ic.galegroup.com. Retrieved 3 January 2018. ^ Harper, Douglas. "Ciceronian". Online Etymology Dictionary. ^ Harper, Douglas. "cicerone". Online Etymology Dictionary. ^ Hasan Niyazi, From Pompeii to Cyberspace – Transcending barriers with Twitter "Account Suspended". Archived from the original on 14 November 2012. Retrieved 7 September 2012. ^ Goodey, C.F. (2013). A History of Intelligence and 'Intellectual Disability': The Shaping of Psychology in Early Modern Europe. Ashgate Publishing. ISBN 978-1-4094-8235-2. ^ Gibson, William (2006). "John Marshall. John Locke, Toleration and Early Enlightenment Culture: Religious Toleration and Arguments for Religious Toleration in Early Modern and Early Enlightenment Europe". H-Albion. Retrieved 8 July 2012. ^ Cicero. "On Duties" (PDF). Archived from the original (PDF) on 19 January 2017. ^ L. Richardson Jr. (1976). "The Princeton Encyclopedia of Classical Sites". Princeton University Press. ^ Redazione ANSA (25 July 2015). "Mayor launches appeal to save Cicero's villa from ruin". ANSA English. Retrieved 19 June 2018. ^ "Villa Cicero". pompeiiinpictures.com. Retrieved 19 June 2018. ^ Mary Beard (2010). The Fires of Vesuvius: Pompeii Lost and Found. Harvard University Press. p. 45. ^ "Palatine Hill". archive1.village.virginia.edu. Retrieved 20 June 2018. ^ Steven M. Cerutti (1997). "The Location of the Houses of Cicero and Clodius and the Porticus Catuli on the Palatine Hill". 118 (3). American Journal of Philology. pp. 417–426. ^ "Rome – Cast and Crew". HBO. Retrieved 5 December 2018. ^ Faria, Miguel A. (14 August 2013). "Caesar's Women — McCullough's Idolatry and Politics in Ancient Rome". Hacienda Publishing. Retrieved 5 December 2018. ^ Higgins, Charlotte (29 June 2018). "Robert Harris: 'I'm not sure you can be the world's superpower and remain a democracy'". The Guardian. ISSN 0261-3077. Retrieved 5 December 2018. ^ "Roma Sub Rosa Mystery Series". www.stevensaylor.com. Retrieved 5 December 2018. ^ Steel, C.E.W. (2013). The Cambridge Companion to Cicero. Cambridge University Press. p. 356. ISBN 978-0-521-50993-0. ^ "Big Finish Originals: Cicero Series 1". Badian, E: "Cicero and the Commission of 146 B.C. ", Collection Latomus 101 (1969), 54–65. Caldwell, Taylor (1965). A Pillar of Iron. New York: Doubleday & Company. ISBN 978-0-385-05303-7. Gruen, Erich S. (1974). The Last Generation of the Roman Republic. University of California Press. Cicero: A Portrait (Allen Lane, Penguin Books Ltd., 1975) ISBN 0-7139-0864-5. Revised edition: Bristol Classical Press, 1983. ISBN 0-86292-051-5. American edition of revised edition: Cornell University Press, 1983. ISBN 0-8014-1628-0 (hardcover); ISBN 0-8014-9256-4 (paperback). Strachan-Davidson, James Leigh (1936). "Cicero and the Fall of the Roman Republic". Oxford: Oxford University Press. Yates, Frances A. (1974). The Art of Memory. Chicago: University of Chicago Press. ISBN 978-0-226-95001-3. Palmer, Tom G. (2008). "Cicero (106–43 B.C.)". In Hamowy, Ronald. The Encyclopedia of Libertarianism. The Encyclopedia of Libertarianism. Thousand Oaks, CA: SAGE; Cato Institute. p. 63. doi:10.4135/9781412965811.n42. ISBN 978-1-4129-6580-4. LCCN 2008009151. OCLC 750831024. Parenti, Michael (2004). The Assassination of Julius Caesar: A People's History of Ancient Rome. New York: The New Press. ISBN 978-1-56584-942-6. Sihler, Ernest G. (1914). Cicero of Arpinum: A Political and Literary Biography. New Haven: Yale University Press. Wikimedia Commons has media related to Marcus Tullius Cicero. Wikisource has the text of the 1911 Encyclopædia Britannica article Cicero.